The Colonel, The BlogFather and Canolis! OK, this is one of my “has no technical value whatsoever” posts. Firstly, I was visiting a local KFC the other day and spotted this poster on the wall (check out the inset pic). The sheer variety of posters depicting the goodwill and benevolence of the Colonel still amazes me. I mean, he’s mixing the batter, he’s helping the children, he’s building Sanders Court and Cafe! Go Colonel! Next, I saw this interview the other day on TechTalk with Rob Caron. The description of the webcast referred to Rob as “The BlogFather of VSTS”!! I almost wet myself, what a classic title, I soo hope Rob gets some new business cards printed with that as his title. 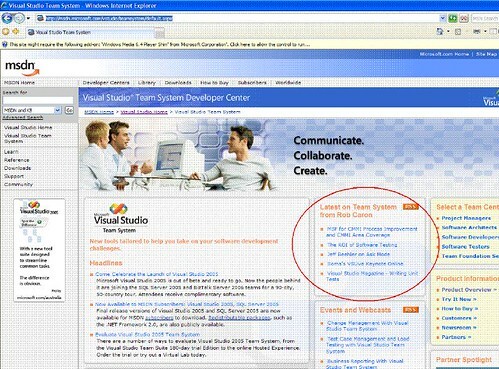 But not only that, I head on up to the VSTS site on MSDN the other day, and amongst all the content is a dedicated slab called “Latest on Team System from Rob Caron”…Rob is the man! I would have preferred the title “From Rob’s lips to your ears” but eh, no stress. And finally, the Dev’Garten launch was a great success, and the BlogFather of Corporate Blogging, Frank Arrigo, made a lightening visit to Melbourne to preside over proceedings, and flew out that afternoon with a box of Canolis from Brunetti’s. Ahh, Clemenza would have been proud!